This is the 3rd post of Skin pH series: Read the 1st post on Understanding Skin pH and its Impact here and 2nd post on Overly Acidic and Alkaline Skin here. MarcieMom: Thank you Dr Cheryl Lee for helping us understand skin pH – what happens in an ideal skin pH 4.6 to 5.6 environment and what goes wrong when it’s too alkaline or acidic. Today we put these knowledge to use on how we can have the right diet and environment for our skin pH! There’s quite a lot of websites proposing that we eat more alkaline foods such as fruits and vegetables of pH 8 to 10 and less acidic foods of pH 3-4 such as soda and sugar drinks. MarcieMom: How does what we eat affect our skin’s pH? Do you in your practice recommend diet for eczema kids based on food pH level, or should it be based on anti-inflammatory properties, or whether it had been studied to improve eczema (e.g. omega 3)? Dr Cheryl Lee: I don’t recommend diets based on the pH of foods, but rather, I recommend diets that are as close to the way they come out of the ground as possible and I certainly do recommend against the ingestion of any processed foods, drinks and candies. The body has robust pH buffering capacities that can help to keep the body at an optimal pH. More important are the effects of oxidation in our diets. I like to explain it this way; our bodies come with a certain amount of “anti-oxidant juice”. When we eat processed foods, animal proteins and sugars, our anti-oxidant capacious are called upon and utilized. When we eat too much of these foods, we exceed the body’s ability to replace the anti-oxidant juice and then the body becomes damaged by the free-radicals and excess sugars that are generated when we over eat or when we eat unhealthy foods. I think the most important dietary approach we should all take is to limit the ingestion of animal proteins as much as possible. Animal proteins have been demonstrated to increase rates of carbamylation. Carbamylation is a metabolic phenomena that happens when we ingest animal proteins. The breakdown products of animal proteins as well urea (this is why I also advise against the use of urea on the skin) in a pro-inflammatory environment that promotes high blood pressure, autoimmune disease, diabetes, heart disease, cancer and more. Interestingly, a recent study even showed that in people who have an infection of the gut with the H. pylori bacteria are unable to adequately detoxify the heterocyclic amines that are generated when meat is cooked. The H. pylori infection make the gut unable to detoxify these chemicals and these chemicals lead to gastric cancer. Excess sugar also leads to something called glycation. Glycation is what happens with excess glucose and glucose metabolic products permanently bind to fat, proteins and even nucleic acids (in our DNA). The combination of the excess glucose and the proteins and fats are called advanced glycation endproducs (AGEs) and they are what ‘gunk up the system’ and lead to many pro-inflammatory pathways. I think it is very important to eat lots of fruits, nuts and vegetables and to limit the intake of sugar and animal protein. Vitamins B1, B3, B6, B12, C and others can be helpful in promoting better food metabolism and in limiting the effects of poor diet. Smoking, pollution, water and sun also affects the skin pH. 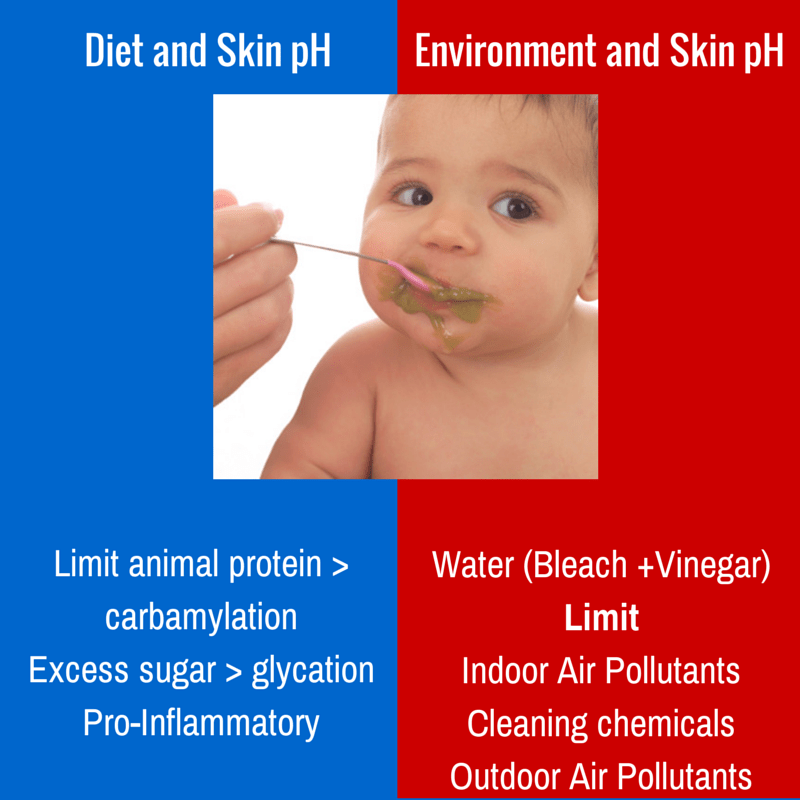 MarcieMom: Dr Cheryl, can you share with us the main environmental contributors and whether it makes our kids’ skin more alkaline or more acidic? What if there are certain factors that can’t be limited, for instance, the water available. Dr Cheryl: Lets start with water. The pH of your particular water supply can be quite variable and can be very alkaline. I think this might be part of the problem in atopic dermatitis and may be part of the puzzle that is missing. We (dermatologists) are having our patients take dilute bleach baths that are adding (though ever so slightly) to the alkalinity of the water and the skin. We do know that the benefits of bleach baths are irrefutable and substantial though. I have started advising the use of a vinegar-based gel to my patients after their baths. They apply this gel to all areas that are affected by eczema and then apply their moisturizers or other topical medications right on top.This seems to be very helpful. This pH gel is something that I have filed a patent for and will be on the market next spring. Another option is to use a vinegar spray. For this I advise that you mix one part white vinegar (not rice vinegar, not balsamic vinegar) from grain (make sure it is not from wheat if you are allergic to wheat) or apple cider vinegar (preferred) with six parts of water and put it in a spray bottle and spray it on the areas of eczema. Follow this with your regular moisturizers or medication. I have also had some of my patients use vinegar baths rather than bleach baths and they too have benefited greatly. I also want to mention the effects of air quality on eczema and our overall health. Studies have shown that INDOOR air pollution can have a major detrimental effect on our health and leads to increased rates of asthma and related conditions and to the overall burden of disease. Chemicals like polyaromatic hydrocarbons (from paints, glues, solvents, cleansers) can increase the rates of many health problems. I always am sure to use VOC free paint in my home. If I paint my furniture, I will leave it outside or in the garage for several weeks before I bring it inside. If you can smell it, then you shouldn’t have it in your house. When I redid the carpet in my home, I researched every little facet of carpet chemistry and found that an all-wool carpet is probably the safest carpet to have for this same reason. The newer ‘no-stain’ carpets are bathed in a chemicals that is then baked on to make the carpets resistant to staining. These chemicals have been shown to be very detrimental to our health as well. A few more things I do in my home to help the air quality is to be sure to vent the air when I cook (smoke from cooked food is particularly pro-inflammatory and carcinogenic). I avoid the use of cleaning chemicals in my house too. I usually will use plain old fragrance-free soap and water, or vinegar, or a little bleach (when someone has the stomach flu) and that is it. I intentionally avoid the use of antibacterial soaps and household cleaners as they are unnecessary, toxic and actually induce bacterial resistance in our homes and our bodies. In addition to indoor air pollution, outdoor particulate air pollution is even pro-inflammatory and has been documented to contribute to 22% of the global burden of disease that can be attributable to one’s environmental factors. A study just came out recently that even correlated exposure to polyaromatic hydrocarbons in air pollution to the rates of Attention Deficit & Hyperactivity Disorder (ADHD). Numerous studies have also correlated ADHD to eczema and I believe there has got to be an environmental correlation to the increased rates of eczema too. For years we dermatologists have been schooled on “the hygiene hypothesis” of eczema due to lower rates of eczema detected in children who grew up in rural areas as compared to those who grew up in urban settings. The thought has been that a rural lifestyle exposes one to more bacterial and parasitic antigens earlier in life and that this was to be somewhat protective. I believe the hygiene hypothesis is actually the complete opposite and that is should be called something more like the “lack of environmental hygiene hypothesis” as the effects of pollution in our food, air, and water is clearly and irrefutably a contributing factor to countless health problems and most likely to eczema as well. This concept is very well established from a scientific standpoint, but is lacking in public education. It is my hope that people with come to understand the role of toxins in their environment and that they may take actions to limit them. Thank you Dr Cheryl for sharing with us what you practice in your home too! Next week we will continue with understanding what products we can use to get our child’s pH right!